Real-time notifications update you immediately when the things that matter most to you occur. Without distracting you from getting your work done. A user can customize notifications in MangoApps company intranet & collaboration software to see what works best for them. We, of course, recommend choosing preferences which help you concentrate on your work, without missing anything important. Classifying your news feeds into primary and secondary is the first step in customizing MangoApps with what content is considered important. The primary vs the less important secondary information. Once you have classified the news feed, then you have the control to be selective on how you want to be notified about information that is secondary on your MangoApps enterprise social network. Our internal research shows that once you have made this customization, your engagement in important conversations increases two-fold. Due to the fact you aren’t overloaded with information in real-time! If you are a factory worker on the shop floor or a sales guy on the road you will be notified in real-time of items you consider primary on your MangoApps mobile intranet and collaboration app. For items you consider secondary, you can decide not to be notified at all. Or choose to be notified only on the selections that you have bookmarked/pinned in MangoApps. Our internal research shows that this is an excellent way to increase your engagement on what matters most by another two-fold. Not all projects, groups, and departments that you are a member provide the same collaboration ROI for your time. Furthermore, as the number of projects/groups/departments in your company increases. The real-time notifications and new information a.k.a. Your unread news feeds, start to become a daily overwhelming problem. Our internal research shows that this results in a drop of engagement level and you spend lesser time processing the more critical updates. Employees, customers, partners, and suppliers in teams now have a way to control receiving real-time notifications for important items only. What’s great is that MangoApps platform will do the work of identifying what is important to you and your work. All without you having to tick a long list of checkboxes. The only step you need to do is tell the system which projects/groups/departments you wish to receive important items only and leave the rest to MangoApps! Don’t have MangoApps open in the browser all the time? No problem. Like you listen to your music while working and wish just to be told when something that is important for you comes up? Sure, you got it! MangoApps desktop & Mac native clients provide voice notifications on items that are important to you while you are working. It is almost like someone talking to you instead of you having to read every notification and figure it out. 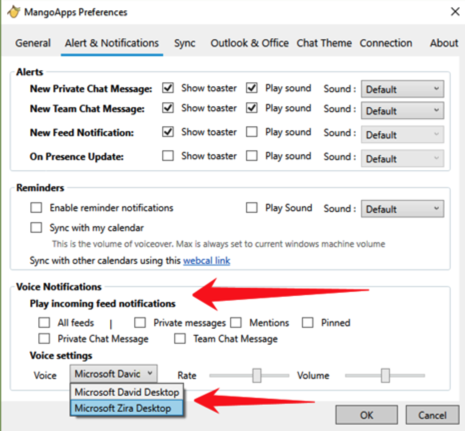 Check this feature out and let us know what ideas you have on using voice as the way to interact with MangoApps and we will be delighted to listen and implement them.